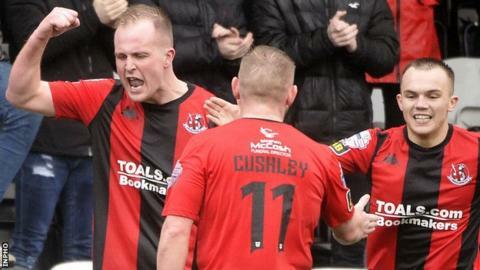 Three goals in seven first-half minutes gave Crusaders a comfortable 3-0 victory over the Sky Blues in the Irish Cup quarter-final at Seaview. Jordan Forsythe slotted in the opener and Jordan Owens fired home before a spectacular strike from BJ Burns. Simon Kelly's hat-trick helped Warrenpoint to a 3-1 home victory over Amateur League minnows Larne Tech OB. Championship side Ballinamallard beat Dungannon on penalties with the game finishing 2-2 after extra-time. The Premiership side's first half dominance at Stangmore Park was rewarded on 32 minutes when Seanan Clucas fired the Swifts ahead with a shot from the edge of the penalty area which went in via the inside of the post. Ballinamallard were more of a threat after the break and Jason McCartney - who had hit the post with a free kick in the first period - brought the visitors level when he arrived to steer home a half-volley from a right wing cross. It went to extra-time and Alan Teggart poked home to put Dungannon back in front but Ryan Campbell headed an equaliser to take it to spot-kicks. Substitute Alan Teggart looked to have won the tie for Dungannon with nine minutes of extra time left when he ran onto Paul McElroy's clever through ball to slot pas John Connolly. But Ryan Campbell responded for the visitors when he headed home through a ruck of players. In the penalty shootout, Paul McElroy, Jarlath O'Rourke and David Armstrong all missed for Dungannon as Ballinamallard reached the semi-finals of the Irish Cup for the first time in their history. Defender and captain Kelly was an unlikely hero for Warrenpoint, hitting a treble to send his side into the last four with victory over Larne Tech OB. The home side suffered a major scare in the second minute when keeper Jared Thompson misplaced a pass and gave the ball away to Craig Todd, who was through on goal and poised to score until Thompson slid in to block his effort. Point opened the scoring two minutes later when visiting goalkeeper Chris Keenan brought Mark Griffin down in the box and Kelly slotted home the penalty into the corner. Kelly doubled the lead early in the second half when he rose highest in a crowded penalty area to head home a left-wing corner. The visitors pulled one back when Sean Ward finished after Point failed to clear a long throw and they looked threatening for a spell, but Kelly completed his hat-trick with another header from a corner in injury-time. A tight tussle was expected at Seaview but Crusaders brushed aside the challenge of Ballymena as they capitalised on the wind advantage in the opening 45 minutes. David Cushley's clever back-heel across the face of goal presented Forsythe with a simple close-range finish after 21 minutes. It was quickly followed by number two with Cushley pouncing on a poor pass in the United defence and setting Owens clear to clip past keeper Ross Glendinning. There a bit of luck involved the third goal but it was still a sweet connection from Burns as his speculative effort from 40 yards sailed over Glendinning and into the top corner. Ballymena failed to make the most of the wind on their backs in a low-key second half and Cathair Friel wasted a good chance when a poor touch denied him a clear strike on goal. The hosts still posed a danger and it required an excellent save from Glendinning to keep out a Forsythe shot.